Enjoy a memorable vacation at our lake house on Keeler Lake in Decatur, MI, only a 2 hour drive from Chicago. The house is a fully furnished modern lakefront home. It has 4 bedrooms, 3 full baths, an open living/dining/kitchen area, and a large furnished 2nd floor loft. The house sleeps a total of 13 people. It is fully furnished with a Pottery Barn decor throughout. The kitchen is fully equipped with a microwave, toaster, coffee maker, utensils, etc., and has a wood dining table for the whole family. There is a large sofa and a wood-burning fireplace in the living room. There's a TV in the family room loft for your enjoyment . The personal touches in decor along with the large bedrooms give you the feeling of being in the comfort of your own home. Enjoy beautiful lake views from the living/kitchen/loft/bedroom areas. Four Winds Casino Resort in Hartford is aprox 10 min drive from the house. The newest hot spot in southwest Michigan has arrived! If you are looking for excitement, Four Winds Hartford is the place to be. This facility has the latest slot machines, table games and a second location of the popular Timbers Restaurant. We have 2 kayak's and one paddle board on the beach for the renters use. 2 separate patios sets for eating outside. One covered with umbrella and other not covered. Bocce ball, badminton, Horse shoes, small riding toys, children toys and games, chess game, fishing rods, plastic beach toys. Beautiful home, great time with the family. The home was very clean, beach and boat were fun, and room for the whole family. We totally enjoyed the Keeler Lakehouse and would highly recommend! While there, we found that time was not too important and we just had fun!! The owners have a lot of extras to make staying very comfortable. Thanks! The home on Keeler Lake was well designed and cared for. We particularly appreciated being able to seat all 11 of us at meal time and all together! The toys available for the children were also a bonus! Thank you for allowing us to enjoy our week together! There was so much to love at Keeler Lake House. The house was well decorated, clean and well maintained. The homes layout worked well for our large group (8 adults and 9 kids (0-13). The large kitchen with 2 tables gave for plenty of space at meal time. The loft area was great for playing games and building puzzles. The bedrooms were nicely sized and cozy. The kids loved fishing directly from the dock. Small sunfish were a quick catch & release and my son is still talking about catching over 200 fish on the lake. The fishing boat, kayaks, paddle board and peddle boat were great for enjoying the water. The kids enjoyed playing in the sand on the shore but the lake has a pretty mucky bottom so it wasn't as great for swimming. It would have been ok once you got out further. Silver beach on Lake Michigan is only a 30 minute drive and has beautiful sand, great swimming area, carousal, snacks, and ice cream. It is a great little trip. The road around the lake is perfect for nice walks and bike rides. The owners, Michelle, & Joe were friendly and easy to work with. We would definitely stay again. The house was perfect for our group of 13 (four different families) including four young children. The house is spacious and the kitchen was great since we cooked a lot of meals. The motor boat and other lake toys got a lot of use and the kids were always entertained. Other lakes are close by and we brought our own fishing boat to visit those as well. Would definitely recommend staying here. Michelle was very helpful and even waited an extra hour to give us a tour of the house. A group of old friends rented this house for a reunion. It fit our needs perfectly. The house is beautifully appointed and set in a lovely spot. The lake is pretty but not good for swimming as the bottom is full o f slime and algae.but as we weren't interested in doing that we were OK. There are kayaks and and SUP as well as a paddle boat and a run about. Christine, the owner, and Michelle, the manager, we very accommodating and easy to deal with. We plan to return. Rent this place. You won't be sorry. 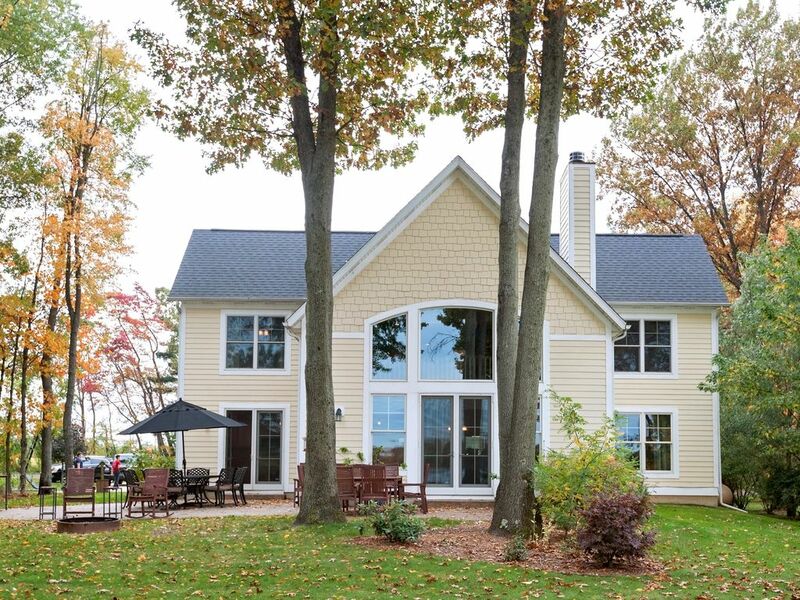 Enjoy our beautiful 2 year old modern home in Southwest Michigan, only 2 hours from Chicago. Keeler Lake is 100 acre all sports lake close to Sisters Lakes. Enjoy summer lake activities like swimming, boating, tubing, water skiing, etc. There are usually summer festivals and activities in and around town. Go berry picking, enjoy farmer's markets, winery tours, day visits to St. Joseph's town and beautiful beaches. Nearby Hartford has a drive-in outdoor heater. In the Fall, visit the many area pumpkin farms, apple-picking, haunted houses, and hayrides. Winter activities include ice fishing, skating, nearby snow tubing and skiing. Pick and cut your own Christmas tree before heading home at the nearby tree farms. Ski: Ski Resorts: Timber Ridge - Kalamazoo Swiss Valley - Jones Bittersweet -- Otsego Cannonsburg Ski Area - Cannonsburg FIVE PINES MINISTRIES Tubing--20 minutes from house Offers you and your family EXCITING winter enjoyment on their specially constructed 400-foot tubing hill. Grab one of their big, tough tubes and head for the hill. The tubing hill is even lighted for nighttime fun. Love to cross country ski? Five Pines features one mile of groomed cross-country ski trails, with plenty of equipment available. Trails vary from hilly to flat open land in beautiful wooded countryside. Anyone from a pure beginner to the experienced skier can enjoy an afternoon on the trails. The Harv Chrouser Activity Center is open as a warming house, where the wood stove creates a cozy atmosphere to enjoy talking with friends, playing games, or reading a book. You can browse Scofields' General Store, featuring t-shirts, other logo merchandise and assorted trinkets. Snack shop available. Additional information about rental rates $2,000--4,500/Week or $400/500 night, depending on season During the fall months- a discount of 28% is given for full week rentals! Check-in: 4:00pm Checkout: 11:00am No smoking in the house. $500 security deposit required, refundable within 1 week after checkout 50% required at time of reservation; this is refundable if it's more than 90 days prior to booked week or provided the house can be rented for that week.